Recently, AJA had a two day launch event in Los Angeles hosted at the ASC Clubhouse and at the Mack Sennett Studios. The event was a reintroduction of sorts for the CION as it recently began shipping just before Christmas. The first leg of the event gave ASC members an intimate look at a production model of the camera along with dinner and a Q&A from the AJA team. The second day of the event was much more hands on and attendees were allowed to actually handle several cameras mounted in various manners. There we were able to catch up with John Thorn, Sr. Product Manager for AJA and the designer of the CION. You may recall in our coverage of NAB 2014, the AJA CION was supposed to be released in July of last year. However, according to Thorn, AJA held the camera because of some compelling feedback from NAB attendees they wanted to incorporate, as well as refining various features of the long awaited camera. As Thorn puts it, “At AJA we’ve never brought a product to market we felt was not credible or ready to go.” You have to respect this, because more often than not, manufactures are rushing to market with half baked products leaving an unsuspecting consumer to be used as a beta tester. According to Thorn, what sets the CION apart is its ergonomic design and the amount of connectors, (2:42 in the video). Thorn went on to explain they wanted users to be able to craft in camera looks to shoot footage with at the very least a “close to finished” image. The idea according to Thorn was to eliminate color grading in post. First thing you’ll need to consider is the media. You can’t just use any SSD off the shelf. According to Thorn, the inconsistencies of off-the-shelf SSDs can cause real problems when it comes to image capture and playback. To counter this, the CION is restricted to using only AJA’s Pak Media which will run about $400 for 500 gigs. Additionally, you’ll need AJA’s Pak Doc to read the files, and it retails for $400. 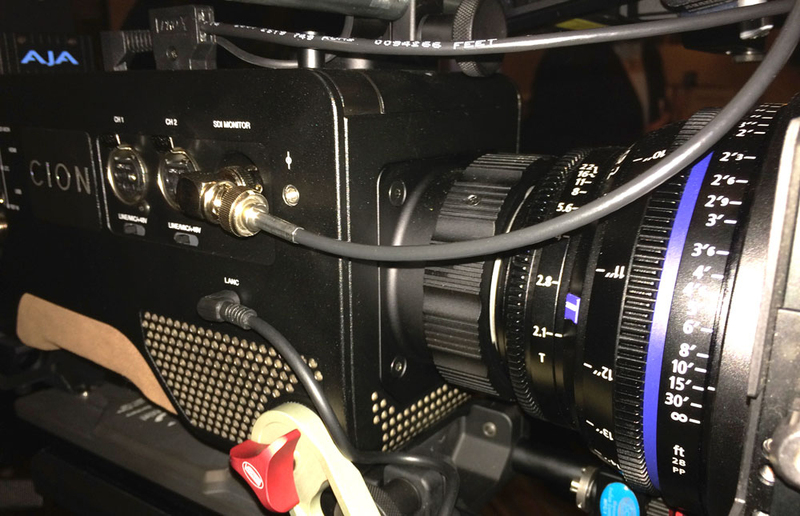 The only monitor the CION has is a small LCD on the side of the unit, so you’ll need an EVF which can run from $1000 to $3000 or more. The CION ships with AC power only, and a battery adapter plate, so look to invest in an AB or V Mount Battery which is about $1500 for a single battery and charger. The CION ships with a PL Mount, so if your lenses are EF mounts, you’ll need an adapter or change the mounts on your lenses if possible. In regards to support gear, you’ll also need to invest at the very least in some sort of handles for handheld shooting which can run anywhere from a few hundred to several thousand dollars. The quality and craftsmanship of the AJA CION seems to be very high. It’s clear that Thorn and team have put a tremendous amount of thought and care into the CION. Having said that, if design and the ability to craft in-camera looks are the two features that set it above other cameras, I have to wonder if it’s enough to justify the cost of the camera, ($8,995 MSRP) and all of the accouterments it requires to function. Having a near-finished image right out of the camera is nice, especially if you have a “lookyloo” director or producer who doesn’t get color correction and keeps asking why the image looks so washed out. Additionally, you can see why this would be desirable in a broadcast environment where turnaround is fast, or you can’t spend hours in a color suite. However, when you’re talking features, episodic television, music videos and even high-end commercials, color grading is where the magic happens, and the notion of having a camera that produces a baked in image may only appeal to low budget productions or projects with a short turnaround. Of course the CION can produce a flat image, but AJA is touting its ability to produce a finished image, and if that’s their key feature I’m not sure how relevant it is. Finally, the idea of using proprietary media seems archaic. Remember when Sony finally buckled and started making SD adapters for their cameras? That was a glorious day for the common man! Do we really want to commit to a device that forces us to use their proprietary media? To be honest, it feels a bit like asking to be put in shackles. Thorn says off-the-shelf media can be unreliable, (video 3:54) but the truth is that CFast, SSDs and even SDs and Compact Flash cards have come a LONG way. ProRes recorders from Atomos can even use spinning disks reliably. Now more than ever off-the-shelf media is dependable and (if you’ll pardon the pun) solid, even after multiple uses. For AJA to use a cautionary tale about the failure rate of off-the-shelf media as the reason CION’s proprietary media is dubious at best. Having said that, if you’re willing to commit to using only their media, the AJA CION seems to be a solid camera that produces a great picture, and I can’t wait to see what people will be doing with it in the coming months. The AJA retails for $8,995 and is shipping now.